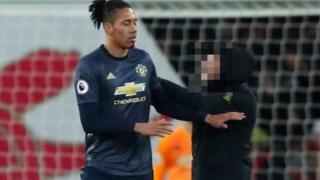 A man has been charged with assaulting Manchester United defender Chris Smalling during a Premier League match at Arsenal's Emirates Stadium. Gary Cooper, 30, of Styventon Place, Chertsey, Surrey, is charged with common assault and encroaching on to the playing area. He was bailed to appear at Highbury Corner Magistrates' Court on 26 March. The charge relates to an incident about 70 minutes into Sunday's match which Arsenal won 2-0.